Beginning May 15, visitors to the Akron Art Museum will have the opportunity to engage with The Talking Cure, a multi-media project by New York-based sculptor Melissa Stern. The traditional media of clay sculpture and drawing blend with creative writing, the spoken word and mobile technology in this exhibition. Viewers are encouraged to look, listen and read while considering their own interpretations of the work. 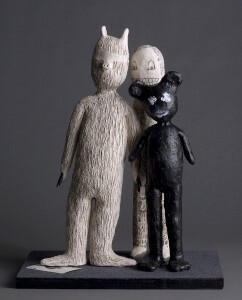 The humanoid sculptures featured in The Talking Cure come from the artist’s imagination, which “is inhabited by a universe of people who look a little like you and me.” Made physical through clay, wood, found objects and other materials, the personalities of these characters prove ambiguous. Precariously balanced and often lacking a limb or facial feature, they may appear vulnerable, humorous or mischievous, suggesting and eliciting a range of human emotions. Rather than describing her sculptures in her own words, Stern invited twelve writers to express their impressions. Poets, screenwriters, playwrights and novelists responded with monologues they imagined running through the minds of the figures. Stern then asked actors to read the monologues aloud without directional cues. Using a smartphone with a QR code-reading app, viewers can scan codes adjacent to each sculpture in order to hear these audio recordings. Visitors who prefer to use a device other than a smartphone are welcome to borrow preloaded mp3 players, available at the museum’s front desk. Twelve mixed media drawings accompany the sculptures. 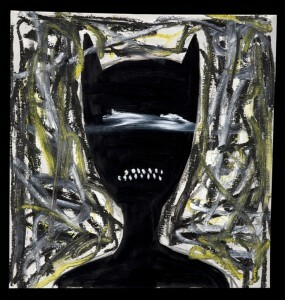 These works address psychological states and experiences in a non-narrative, image based way. The seminal psychologist Sigmund Freud described his psychoanalytic method as “the talking cure.” In appropriating this title for her project, Stern references her interest in the psychologically-potent subjects such as memory, childhood and family. This exhibition is presented by the Akron Art Museum in collaboration with the Institute for Venture Philanthropy. 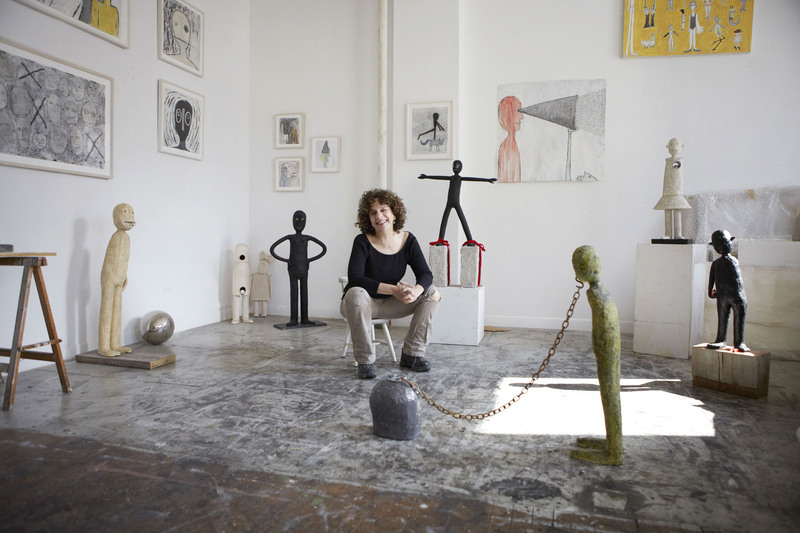 With a background in anthropology, Melissa Stern creates work that reflects both non-Western and outsider art influences. Her drawings, collages and figurative sculptures are characterized by their richly drawn and deeply layered surfaces, as well as their quirky, often dark humor. Stern’s work has been exhibited in Europe, across the United States and in the Third World Ceramics Biennale 2005, Icheon, Korea. Her works are reproduced in several publications, and feature in a number of prominent corporate and museum collections including Dow Jones, JP Morgan, The Arkansas Art Center, American Museum of Ceramic Art and the Kohler Corporation, where she was an artist-in-residence. Stern was most recently artist-in-residence at the Benyamini Center in Tel Aviv, Israel. Her latest multi-media, cross-cultural project, “Souvenirs,” will debut in New York City in 2015. Get the first look at The Talking Cure on its opening night, with a chance to meet the artist. Melissa Stern will talk about her project in the gallery, and will be available to sign copies of the exhibition’s accompanying hardcover book (sold in the museum store). Taking inspiration from The Talking Cure, this instructive writing workshop will focus on Freud, the self, and the art of narrative. Led by Buried Letter Press editor Matthew Mackey and local authors Robert Miltner and Molly Fuller, this workshop is open to writers of all levels and styles. Recommended for ages 13 and up. Free for museum members. Cost is $7/non-member and includes gallery admission. Registration encouraged. https://akronartmuseum.org/eventregistration/. Drop into The Talking Cure in Corbin Gallery to hear stories inspired by Melissa Stern’s exhibition read out loud by Akron’s Buried Letter Press. Explore the unconscious and listen to original narratives from both patrons and local writers!